Pioneers in the industry, we offer steam jacketed cooker, non jacketed steam cooking system, jacketed steam cooking system, sealed kettles, bulk steam cookers and steam kettle with stirrer from India. 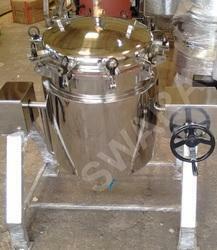 We have manufactured Steam Jacketed Cooker having different capacity. We have also manufactured Pressure Vessels with Agitator. Our Vessels are manufactured from Food Grade Stainless Steel with different working pressure. Our Jacketed Steam Cookers are Hydraulically tested. 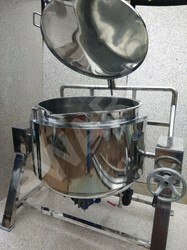 It Is Tripple Layered Cooking Vessel Made From AISI Stainless Steel 304/316 L, Food Grade Quality Material For Cooking Of Rice (50 Kg In 20 Min), Dal (35 Min), Vegetables( 30min), Milk (150 Ltrs In 25 Min), Pulses (30 Kg In 45-50 Min), Potatoes (140 Kg In 25 Min), Khaman (17 Kg In 15 Min), Pasta (120 Kg In 30 Min), Non Veg, Water. The cooker is provided with Solid Stainless Steel Shafts supported on special bearings mounted On Heavy Duty S.S. Tubular Stands. The complete cooker is polished & buffed to mirror finish for hygienic cooking. Gear / Manual Type tilting arrangement is provided to unload the vessel. The Vessel is designed for Jacketed Steam Pressure & Tested Hydraulically Steam Pressure. Being a client centric firm we are involved in offering an extensive range of Non Jacketed Steam Cooking System. These are manufactured using quality assured raw components and advanced technology under the supervision of experienced professionals. 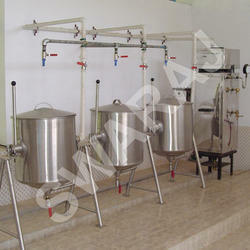 Offered products use latent heat of steam for quicker cooking and are very efficient in nature. Additionally, we also assure safe and timely delivery of our products. Maintains Nutritional Value, Protein, Vitamins, Quality & Taste Of Food. Avoids Blemishing & Overheating Of Food. Requires Less Time @40% Less than conventional cooking easy to clean & maintain. Optimum utilization of steam enthalpy due to a high degree of superheat. 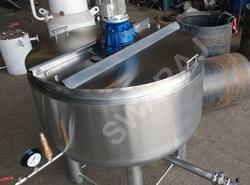 Completely hygienic & safe boiling than any other method food is cooked In SS 304 vessel. Vibration less & noiseless boiling & cooking in this system. Effective heat transfer less time to cook food. We provide one-year free replacement guarantee with our system. On installing such modern technique of cooking you enhance your kitchen. Reduction in cooking cost by 50%. Hybrid steam generators with Dual Fuel - Firewood/Bio Gas/LPG/Solar/Electricity/Heat. Very safe & easy to use unskilled labors also can use the system. We provide one-week free training after installing, one-year free service. 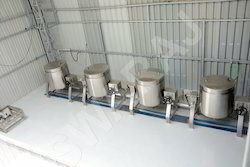 We are leading manufacturers Of Jacketed Steam Cooking System in India, we have provided various option in cookers like, Jacketed & Non Jacketed, Sealed & Insulated Cookers, suitable for cooking & processing of food In Commercial Kitchens, Food Processing Industries, Schools, Charitable Trust, Mid Day Meal Organizations, Army Establishments Etc, where food is processed at Industrial Scale. Our steam cooking systems are widely accepted in Urban, Rural & Tribal Areas of India. In steam cooking food is cooked by steam that retains vitamins, minerals & nutritional value of the food, oil & fatless cooking. Our customers can avail from us Sealed Kettles that are available in various sizes and capacities at market leading prices.Completely SS 304 construction Triple layered Double Jacketed Insulated sealed vessel made from AISI S.S. 304 stainless steel (Jindal/Salem) food grade quality material for processing of Food. Heavy Duty Silicon Gasket will be provided for Sealing of Vessel. The vessel is designed for steam pressure. Kettle will be provided with Two Safety Valves one in Jacket other on Top Cover. Kettle will be provided with Two Pressure Gauges one in Jacket other on Top Cover. Ball Float type Steam Trap, leak proof Steam Entry suitable up to 10 Bar Steam Pressure. Kettle will be Hydraulically tested. We are pleased to introduce ourselves as manufacturers of Bulk Steam Cookers of various capacities. These cookers are manufactured from food grade quality Salem Stainless Steel. By virtue of this system, you can cook food for 500 to 20000 individuals in less time. Our customers can avail from us Steam Jacketed Kettle with Stirrer that is available in various sizes and capacities at market leading prices. All these products are widely demanded by several industries like food, chemical, petrochemical, and packaging. 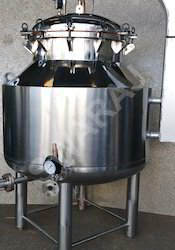 Steam Jacketed Vessel is designed with specially Stirrer with Teflon Scrapper, provided with Vario Drive Mounted On Heavy Duty Stand, suitable for sambar, dal, sauce, fruit juice, milk etc. Looking for Steam Cooking System ?